We’d love your help. Let us know what’s wrong with this preview of 1981. by UniQue Webster. It exposes the ugly truth of addiction, unveils the effects of abandonment, exposes unspoken abuse and illustrates the impo 1981. contains past letters, thoughts, poetry and very personal writings; retelling the journey of a woman dealing with the trauma of being abandoned at birth by her biological mother and the ensuing attributable effects of obesity and food addiction. 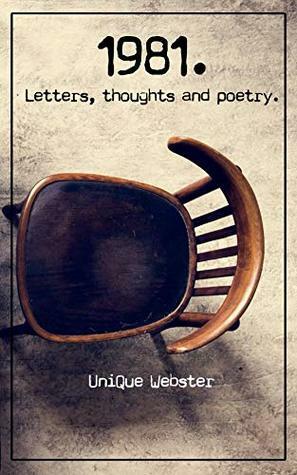 Noted writer and former Entertainment Editor, UniQue Webster shares her life experiences in a detailed epic; articulated in a deliberate yet vulnerable manner. “Since 1981, I've experienced and observed happiness, sadness, joy, and despair. I thank the many people I've encountered on my journey, thus far. I thought, in the process of compiling the works for this book, ‘I endured much sadness.’ I was reluctant to publish this body of work in fear of judgment. I wrote my first poem at the tender age of 13. Quite a few poems from that era made the cut. To ask other readers questions about 1981., please sign up. Be the first to ask a question about 1981. Her professional and civic career has thrived in places as diverse as the hustle and bustle of the metropolis' of NYC, Chicago Despite dealing with the trauma of being abandoned at birth by her biological mother and the ensuing attributable effects of obesity and food addiction, UniQue Webster has carved out quite a successful and varied career in Health and Wellness, Business and Self-Empowerment. Her professional and civic career has thrived in places as diverse as the hustle and bustle of the metropolis' of NYC, Chicago and DC to the sleepy towns on the outer banks of the Carolinas. Webster has worked for notable organizations such as Best Buddies International, the CityKids Foundation, VH1 Save the Music Foundation, BET Networks and The Arts Council to list a few. She has written over 50 articles for more than six national publications, digital media and blogs. In 2012, Webster worked with weight loss giant, Weight Watchers, as a staff blogger as well as leading 15 weekly health and wellness meetings. During her tenure, she had the pleasure of joining Weight Watchers' CEO and Executive Staff in the ringing of the closing bell at the New York Stock Exchange. Due to her impeccable work ethics, Webster received a number of accolades and awards; including a Proclamation of Excellence by New York City Council member Tracy L. Boyland, then Chair of Women's Issues.